Amazon Bets On Web Groceries, Expands AmazonFresh To L.A. Confirming reports from earlier this month, Amazon has today expanded its online grocery service AmazonFresh to it first non-Seattle market: Los Angeles. The company homepage was quietly updated this morning with news of the expansion, and the AmazonFresh mobile applications for iOS and Android have been refreshed as well, announcing the new availability. 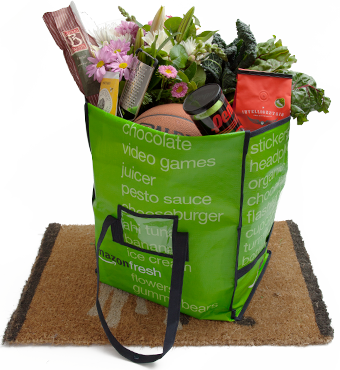 L.A. customers will now have access to AmazonFresh’s over 500,000 products, the company says. Earlier in June, a Reuters report stated that Amazon would be bringing AmazonFresh to L.A. and San Francisco this year, with twenty more markets scheduled for 2014, including some outside the U.S. Now the first of those expansions is live, in select L.A. zip codes. Amazon Prime members can test the service under a free 90-day trial, then will be charged $299 for the next year, and annually after that, the AmazonFresh website explains. This charge, though seemingly high, actually includes the $79 Amazon Prime membership, too, which offers other member discounts like free two-day shipping, Amazon Prime Instant Video access, Kindle Lending Library access and more. Still, the price for Amazon Prime Fresh will still dissuade bargain shoppers for now, instead targeting those who value convenience more than others. That should also keep the user base from expanding at too rapid a rate, possibly outpacing the number of orders Amazon can feasibly handle at this point. After all these years, the $568 billion grocery market is still ripe for disruption by online retailers like Amazon, especially as it and others are now beginning to figure out the logistics and opportunities surrounding same-day delivery. Google, eBay, Walmart, and even startups have been experimenting with similar same day delivery services, all looking to tap into consumers’ desire for conveniences on-call with a tap of a button. But with grocery items, there are a number of hurdles to overcome – perishable grocery inventory has to be stored and transported refrigerated, which is costly. Getting the margins right is key, and it’s something which Amazon has been working on for years. You may remember all the way back in 2007, the company had announced AmazonFresh as an invite-only service in Seattle, while memories of dot-com flameout Webvan were still in recent memory. Amazon has had half a decade to trial, test and iterate, which gives it an advantage. But it could also face serious competition from Walmart, which though now the world’s largest brick-and-mortar merchant, has been losing ground to Amazon online. Last week, Walmart CEO Mike Duke announced the company was poised to hit $10 billion in e-commerce sales this year, but the retailer also recently said that it has no immediate plans to expand its U.S. grocery delivery operations outside of tests in California right now, because it’s not convinced there is significant consumer demand at this time. That hasn’t stopped other companies from reading the tea leaves and launching services betting on online grocery trends, most recently mySupermarket.com which just today announced the expansion of its “Kayak for web groceries” service, now available in the U.S.
AmazonFresh is accepting sign-ups from L.A. users here.